Book a Dadami Room for your next event. Book one of our private rooms for your next event. All private rooms are booked by reservation only. Parties under 10 persons must be have all members present in order to be seated. Parties of 10 or more must have at least half of the members present to be seated. AI Fusion offers both traditional and standard style private dining rooms that are perfect for birthdays, holidays, office events or just a night out with friends and family. 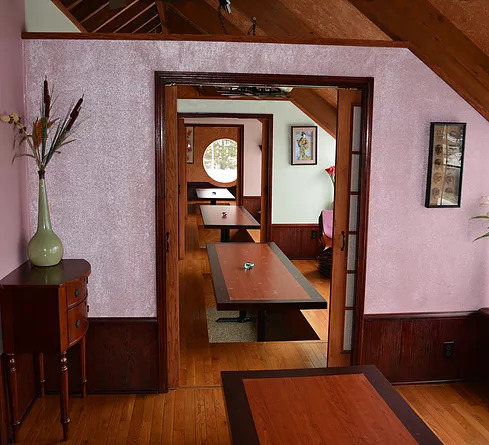 The traditional Japanese style Dadami rooms feature sunken table tops and on the floor seating for parties of 6 to 8 people. Reservations are required and we ask that you please remove your shoes before entering the rooms. The standard style rooms offer Asian inspired décor with tables and chairs. These private dining areas can accommodate parties ranging from 6 to 25 (parties larger than 25 please contact us for more options). Reservations are required so call today and book your next event with us! AI Fusion offers both traditional and standard style private dining rooms that are perfect for birthdays, holidays, office events or just a night out with friends and family. The traditional Japanese style Dadami rooms feature sunken table tops and on the floor seating for parties of 6 to 8 people. Reservations are required and we ask that you please remove your shoes before entering the rooms. The standard style rooms offer Asian inspired décor with tables and chairs. These private dining areas can accommodate parties ranging from 6 to 25 (parties larger than 25 please contact us for more options). Reservations are required so call today and book your next event with us!